I started watching Doctor Who when a professor offered extra credit if someone could name the person on the screen. I was, this close to getting it right. I was intrigued that a biblical studies professor watched a sci-fi series. Don’t the professors read the Bible all day and commentaries all night? There was no turning back. My interest was piqued and soon I was binge-watching on Netflix. I laughed, I cried, I became a huge fan. Doctor Who is a British show that has been around for over 50 years. The Doctor is a brilliant, witty alien from the planet Gallifrey who, along with his companions, travels through time and space. 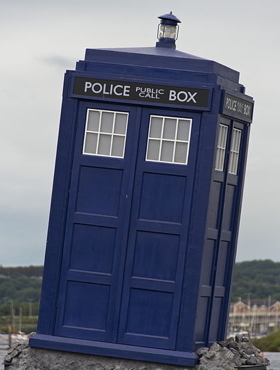 His spaceship, the TARDIS, looks like a blue phone box—but bigger on the inside. The quote is from an episode last season. The Doctor is trying to prevent a war, but the idea of cruelty goes beyond war. In wars, there is torture and death. A group of people is being cruel to another group of people for some ideological reason. But, beneath that, there’s more. People in war are cruel because people are cruel. There is a thread of cruelty that weaves through the stories of human existence. From the elementary school bully to those responsible for maintaining our country. Going against the teachings of Jesus, the cruelest of people seem to be the ones that Americans celebrate. Cruelty exists in the school-age bully. The bully needs to make the life of someone else less tolerable. They don’t really care who they hurt as long as they inflict pain. Unfortunately, the school bully often grows up to be an adult who is no better. There’s cruelty against marginalized groups. Recently, the Georgia Senate unanimously agreed to a bill that effectively discriminates against a group of people. The governor has not approved it yet. For many years, African-Americans, women, Hispanics, and LGBTQ communities have fought for equality. They have fought against systems of cruelty that continue to discriminate against them. We live in a cruel society that tells us to do anything we can to get ahead and make a good life for ourselves. We promote people who play the game. We give them excellent salaries and benefits. When profits shrink, it’s not the executives who suffer; it’s the person who makes just enough to support his or her family who is discarded. That’s the cruelty of a society that values money over people. When things go wrong, revenge seems like the best plan. We tell our kids to hit the bully in order to stop the abuse. We sue companies for wrongful termination. Evening the score feels so good. We take part in the cycle when we fail to recognize the equality of those people who are different. The problem is that this cycle of cruelty never creates peace. The situation at hand escalates to something even worse. The Doctor reminds us there are options. When bad things happen to us, either we can get even or we can stop the cycle. The Doctor’s words remind me of Jesus’ words. In the Sermon on the Mount, Jesus says “You have heard it said, ‘Eye for eye, and tooth for tooth.’ But I tell you, do not resist an evil person. If anyone slaps you on the right cheek, turn to them the other cheek also.” By turning the other cheek, we are taking an active part in de-escalating the problem. We have the option to stop the cycle of cruelty and find peace. Instead of exacting our revenge, we have to find ways to reconcile. Corporations can be greedy entities, but we don’t have to hurt them when they do us wrong. We don’t have to make friends with our tormentors, but we don’t have to stoop to their level either. Our voices become important when we stand up against cruelty. We don’t have to support the people who believe that discriminating against others is in any way okay. We can vote for the candidates who consider alternatives to bombing our enemies. Each day we can make the choice. We can live in a peaceful and forgiving way or we can continue the cycle of cruelty. Stacie Whalen is a student at McAfee School of Theology. She loves Jesus, her family, and many geeky things.